Chocolate Chili Ice Cream - Do You Know The Muffin Man? Notes: I did not have the tiny pequín chilies so I took a morita chili and infused the milk and cream with it, then minced it to add to the mixture. My only other deviation was to omit the almonds, as I felt they would compete with the other flavours. And what flavours: when you put this ice cream in your mouth, you taste the cinnamon and chocolate first. As it melts, the chili flavour starts to grow and then you taste some of the smokiness of the morita. An amazing ice cream. If I ran an ice cream store, this would be a regular feature. 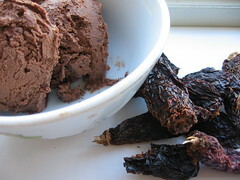 Update (2008-05-10): I made this again, this time using pequin chiles, but infusing the crushed flakes in the cream, and omitting the chopped chocolate as I did not care for the texture it created the last time I made this ice cream. The toasted almonds add a nice crunch, and the amount of chile is just enough to add some heat. Extremely tasty. Highly recommended.